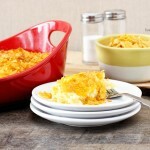 Tuna Casserole Recipe | A Family Favorite! I have a super simple and delicious recipe for you today. 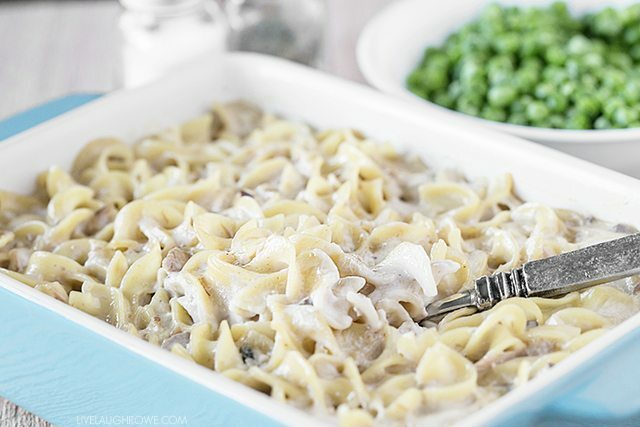 If you like noodles, tuna and casseroles — then you’re in luck! 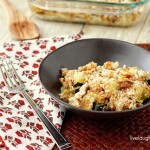 This Tuna Casserole Recipe will not disappoint. In fact, you might want to double it! Family dinners were a BIG deal growing up. Since I can remember, my Mom had dinner on the table at 5 o’clock every night. While mom cooked, my sister and I would set the table. All five of us would then gather around the table, bless the food and dig in. During dinner, we chatted about the day, homework, church activities, etc. 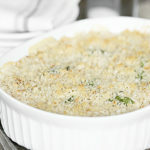 This Tuna Casserole is something I’ve been enjoying for a long time. Throughout the years, as I whip up this dish, I’m always reminded of family dinners. Be that as it may, it’s now comfort food at it’s finest. 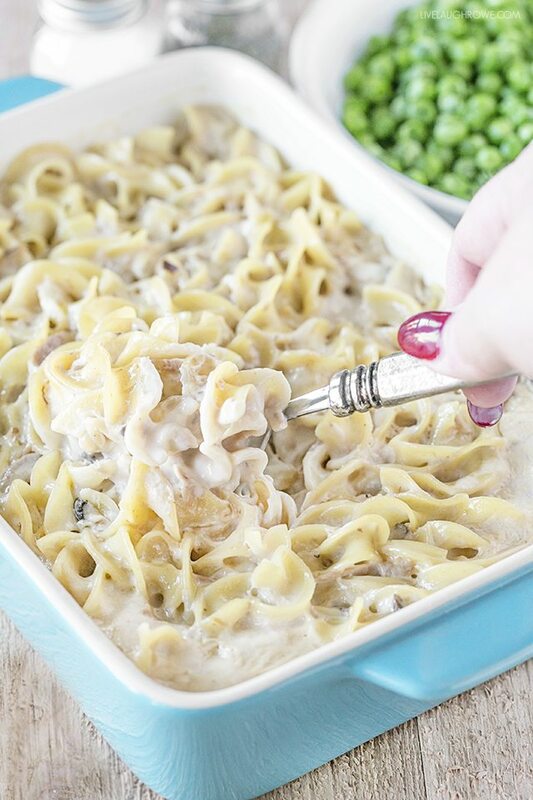 So, are you ready to take a look at how quickly you can pull this noodle casserole together? Let’s do this! Mix together the evaporated milk, cream of mushroom soup and tuna fish in sauce pan. Heat through until creamy. 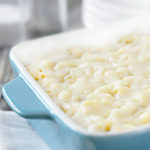 Place noodles in 1 1/2 quart casserole dish and pour sauce over noodles. And while that sounds delicious on it’s own, one must not forget to serve with peas and apple sauce. Maybe peas aren’t your thing, so serve with a vegetable of choice. However, my recipe card says to serve with peas and apple sauce — so peas and apple sauce it is. Plus, you get both your fruits and vegetables. Boom! 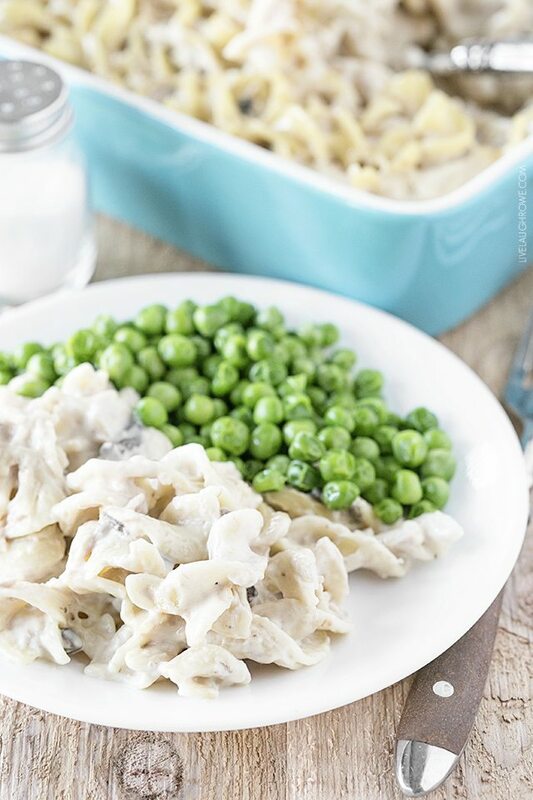 My mom used to put the peas IN the tuna casserole. I wasn’t a big fan of that as I am not a fan of peas. When I saw your photo I immediately though – to pea, or not to pea, that is the question. Would this work with cream of celery? My husband hates mushrooms and my daughter doesn’t eat chicken. Thanks! Hi Elizabeth 🙂 I haven’t tried it myself, but I don’t see why it wouldn’t work. Let me know — and enjoy! Hugs. what size can of Tuna and what size can of evap. milk? I would also like the know the size of evaporated milk. I am planning on making this for dinner tonight, but not sure what size can? Can you help?! Hi Cari. It’s a 12 oz. can of evaporated milk. Enjoy! Do you drain the tuna prior to putting in sauce pan? Hi Kayla! Yep, per the instructions, you’re going to drain the tuna. Enjoy! This is always my go to for dinner after having a long day at work! I am wanting to make a bigger pan of this, using a whole bag of noodles. Should i double the milk and soup cans? That way it will still be creamy?